We checked out of MyStay Hotel in Ueno. Went to DoCoMo and cancelled my cell phone contract. Went on a river cruise on the Samida River. I caught the SkyLiner out to Narita Terminal #3. Flying Jetstar JQ12 from Narita to Coolangatta overnight. Today is the 10th Memorial of my late Father's death. 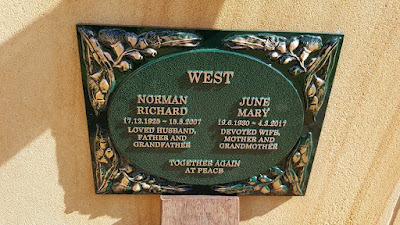 Coincidently the plaque was placed on the joint graves today. We went for a stroll through Ueno Park. Unfortunately the museums were closed because it was Monday. to go for a cruise to Odaiba and back. I ate some not-sweet soft cream / gelato ? Really good. We went on a dinner cruise on this ship in January, 2008 ? About. We ate a late lunch. we drank tapioca drinks in a cafe near Ueno Park. The Skyliner on the Keisei Line about to take me to Narita T3. How many times have I taken this flight now ? Thank you for the last exactly 13 years.